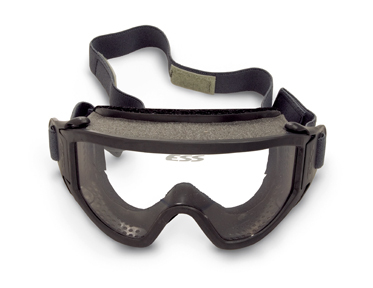 Manufactured by Eye Safety Systems, (ESS) who has quickly built a reputation as a leading manufacturer of wildland fire, technical rescue, and tactical goggles, this model exceeds the requirements for ANSI Z87.1. Aggressive ventilation slots allow moisture inside the goggle to escape, thereby reducing fogging when used for water rescue or in the rain. Unique Tear-Offs, plastic sheets that fit over the front of the lens, not only protect the lens surface, but can be pulled off to clear the lenses quickly when covered with mud or dust resulting from operating vehicles or power equipment. The goggles come with stick-on hook-and-loop pads to keep the straps in place and two Tear-Offs.